Interested in SEO For Beginners? One of the things that I enjoy about keeping up with friends who are involved in different areas of development than I am is all of the cool things that they’re working on. Sure, many are doing cool stuff within WordPress, but there are also a lot of people who are doing things with other technologies in web development, with OS X development, with eBooks, with their blogs, and so on. I’ve had the pleasure of knowing Andrew Mason (no, not of Groupon), for the past several years and he’s someone who’s always got his hands in something media related – be it video production, audio production, or something along those lines. 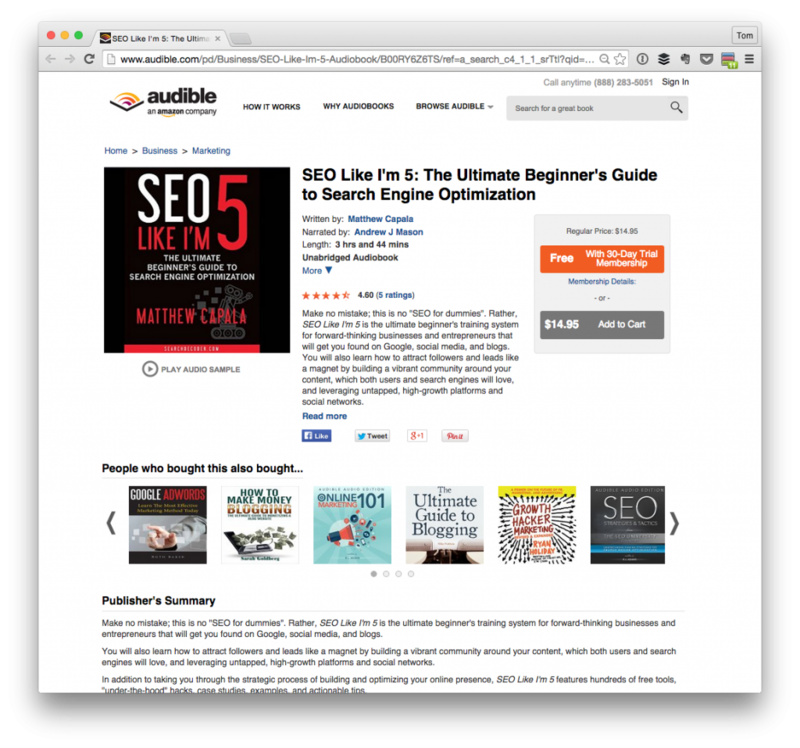 Recently, he was tapped to narrate several audio books on search engine optimization, and he’s been kind enough to offer up several codes for free access to the audio book SEO Like I’m 5: The Ultimate Beginner’s Guide to Search Engine Optimization. But getting to read this book for you was one of the best primers to legit SEO optimization I’ve ever gotten. Nothing dirty. No link bait, paying for likes, or anything like that. Just great strategy for getting better placement in Google. Good luck, and hope you enjoy it! Here’s the deal: I know a number of you that read this blog are just getting started in web development or web consulting in someway. You’ve got an interest in getting involved with content management, WordPress, blogging, and any or all of the above. The comments are closed on this post since there’s really no need for them, so I’d like to hold the five free coupons for the first five people who email me wanting a copy of the book. If that’s you, shoot me an email and I’ll be in touch.